So did you hear that Kalyn from Kalyn's Kitchen came to visit? She did! And being Kalyn, she brought presents! 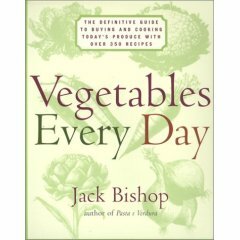 First up was Jack Bishop's Vegetables Every Day. 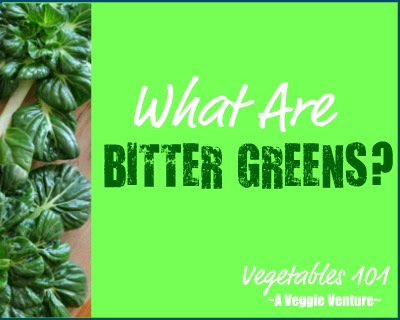 I wondered if there could many new vegetable recipes: there are! I've already made three recipes and there are dozens bookmarked for later. It has potential ... truly ... to become my favorite go-to source for reliable vegetable recipes. Kalyn says there's a little patl bird to thank for the tip on the book. Then she brought salt specially harvested from her hometown of Salt Lake. Cool! FROM THE ARCHIVES ... The Recipe Box is filled with cauliflower recipes. Favorites include this one with pacetta, capers and Parmesan and this cauliflower-tomato medley from my cousin Sharon. In a large skillet, heat the oil over MEDIUM HIGH until shimmery. Add the cauliflower and onion as they're prepped, stirring well to distribute the oil evenly. Let cook until cauliflower begins to brown, stirring often. Add the curry and stir well to distribute, cook for 1 minutes. (Another time I'd be tempted to add this to the yogurt/water mixture.) Stir in the yogurt mixture, cover and let cook for about 10 minutes, until yogurt is cooked down and the cauliflower cooked but still holding its shape. Stir in cilantro, salt and pepper. Serve immediately. I know that it has to be a Penzeys spice since she has a huge collection, but I think I remember seeing that her favorite was Sweet Curry. Now I am off to my life that is refusing to let me blog this week. 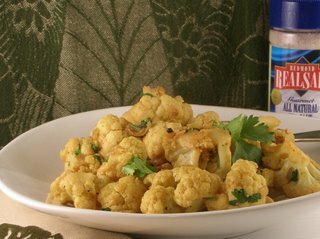 Love the cauliflower and curry combo. I think Indian food is the only time fried cauliflower is called for! mmm, i've got some cauliflower in the fridge just waiting to be used. this looks great! Kalyn would use Penzey's spices without a doubt :) Love that cauliflower! The cauliflower does sound fantastic. I must get Nupur to teach me to grind my own curry powder! (This is after she moves to St. Louis and when I come back.) In the meantime, I guess my favorite is Penzey's Sweet Curry, although I do like their hot curry too. I also buy Sun brand Madras curry powder, which I think is very good for a brand you can get in the grocery store. I'm an equal-opportunity curry eater. I just bought a cauliflower and was trying to decide what to do with it. This sounds like a winner. My kids like a sort of Italian fried cauliflower thing I got out of an old Italian cookbook. I wonder if I can conver them to this. It's much less work! Thanks for the book recommendation too. I'm going to go order it! Mmm, that sounds delish. And Alanna -- love the updated profile photo! That was a really good photo that Kalyn took. It does look good. I will have to put cauliflower on my shopping list this week. I've never tried to grow it? Maybe next year. Except for the cilantro part, I loved this recipe. I will try it soon. Chrispy ~ Penzeys, for sure! Catherine ~ You've got me lusting after fried cauliflower, thanks a lot! Patl ~ It's a good cookbook, not a "resource" how-to-cook-every-vegetable-in-every-way book, but good for those looking for a little every-day inspiration. I've already cooked from it three or four or maybe more times. Kickpleat ~ So funny how often recipes 'call' when we already have the ingredients on hand, that's what happened to me, too! Nupur ~ You know Kalyn, for sure! Ellen ~ More fried cauliflower! What're you guys doing to me?! Lisa ~ Thanks! Two weeks in a row, food bloggers said, You don't look anything like your picture ... must've been time for an update! Coffeepot ~ I'm only good at cooking and eating cauliflower but I'd love to watch someone else grow it! That cauliflower looks terrific! It inspired me to make a cauliflower green curry tonight before the cauliflower in my produce drawer goes bad. 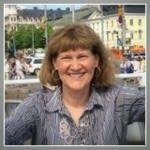 Nice to find your blog, btw - It's terrific!